The rich-poor divide in the US is central to our disunity, Reich contends. (He’s not alone: Ray Dalio, billionaire founder of the Bridgewater hedge fund, agrees: http://www.bloomberg.com/news/articles/2019-04-04/dalio-sounds-new-alarm-on-capitalist-flaws-warns-of-revolution). Unlike Dalio, most of the wealthiest Americans quail at the thought of imposing major new taxes on wealth and love the benefits of Trump’s “tax reform.” What an extraordinary windfall that tax bill is for them and the largest corporations: for example, $12.4 billion in tax savings for Apple, AT&T, Bank of America, Verizon, and Walmart in the first three quarters of 2018 alone. Adding insult to injury, many of these companies are using those savings to cut jobs and buy back their stocks, inflating their value, rather than (as Trump predicted) invest in creating jobs at home (The Hightower Lowdown, February 2019). Meantime, most Americans—nearly 60 percent—support the ideas of Elizabeth Warren, Alexandria Ocasio-Cortez, and others for real tax reform that would force the mega-corporations and the superrich to pay their fair share. Until they do, we are saddled with high taxes and national debt, now roughly $2 trillion. Paul Krugman cites the human interest here: “think of all the other things we could have done with $2 trillion—all the infrastructure we could have built and repaired, all the people who could have been given essential health care” (www.nytimes.com/2019/03/30/opinion/the-incredible-shrinking-trump-boom.html). The American economic story is that wealth inequality increases along with increasing wealth overall. The higher up in the wealth chain one is, and most especially at the top 1 percent of households, the greater the gains in riches. (Keep in mind that wealth disparity is even greater than income disparity.) Here’s one chart to bring this point out: http://apps.urban.org/features/wealth-inequality-charts/. And, as the same source emphasizes, the wealth gap is very much racial: white families at every level of wealth on average are several times wealthier than nonwhite families. The captains of industry in America are not faceless. Far from it: most of them and their corporations are household names, such as Bill Gates of Microsoft, Mark Zuckerberg of Facebook, Jeff Bezos of Amazon, Sergey Brin and Larry Page of Google, Warren Buffett of Berkshire Hathaway, and the Charles G. and David H. Koch brothers. These men may not literally rule the world, but their companies occupy dominant positions in particular industries, their opinions get immediate attention and wide dissemination, and their access to leading politicians worldwide is guaranteed. They are among the handful of billionaires—twenty-six now—who have as much wealth ($1.4 trillion) as roughly 3.8 billion people, or half the world population (Oxfam report, cited in https://thinkprogress.org/26-billionaires-own-as-much-wealth-as-half-the-world-6948c7e2d411/). You can see a list of the top 500 billionaires at http://www.bloomberg.com/billionaires/. The Max 8 became a staple of the Boeing system thanks to a self-regulated certification process—a seamless interaction between company and regulator. “In practice,” inside sources report, “one Boeing engineer would conduct a test of a particular system on the Max 8, while another Boeing engineer would act as the FAA’s representative, signing on behalf of the U.S. government that the technology complied with federal safety regulations . . . ” Limited oversight, as well as an insufficient number of inspectors and the absence of independent analysis, meant that no one had sufficient authority to monitor the monitors (www.washingtonpost.com/investigations/how-the-faa-allows-jetmakers-to-self-certify-that-planes-meet-us-safety-requirements/2019/03/15/96d24d4a-46e6-11e9-90f0-0ccfeec87a61_story.html). It helps, of course, to have the FAA run by former airline executives (its new administrator worked for Delta), and have former lobbyists occupy influential posts in the department of transportation (run, let’s remember, by Elaine Chao, wife of Mitch McConnell). It further helps if you have an army of lobbyists (Boeing has about 100) who spend lots of money (over $15 million a year) doing their job, backed by large donations to political candidates ($2.4 million), 329 of whom now serve in Congress (www.washingtonpost.com/business/economy/us-and-boeing-have-long-had-a-special-relationship/2019/03/16/abcebe8a-475a-11e9-aaf8-4512a6fe3439_story.html). Thus, if we want to know why the Swamp is so hard to drain, we need only look at the phenomenon called MAGIC: the military-academic-governmental-industrial-complex (www.washingtonpost.com/opinions/this-is-what-happens-when-corporations-run-the-government/2019/03/15/fb2c354e-4736-11e9-90f0-0ccfeec87a61_story.html). This tight-knit interpenetration of public and private interests promotes common interests in profit and power. The complex constantly revitalizes itself, crossing party lines. Yes, on occasion there are disruptions to the smooth functioning of the system, such as the Max 8’s (belated) grounding and federal investigation, the pressure building on Facebook over sharing of private data, and the European Union’s fines of Google. But no one should doubt that these companies will survive and continue to prosper. They have the MAGIC. Thanks, Bob. 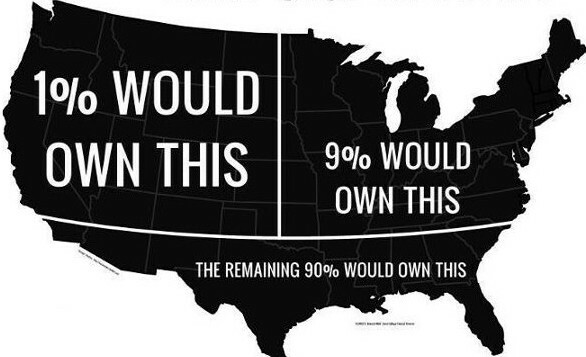 Yes, US assets have always been a bargain, though I’m not convinced they should be counted as part of “our” 1%. A simple word for all of this is corruption. America is as corrupt as any dictatorship.